Size is approximately: 48" Length. Diameter of the top ring is 9.5" and 7.5" for the bottom ring and height of the round basket is 5.7". No plant or flower pot included in this item! Ideal for planters up to 8" in diameter. 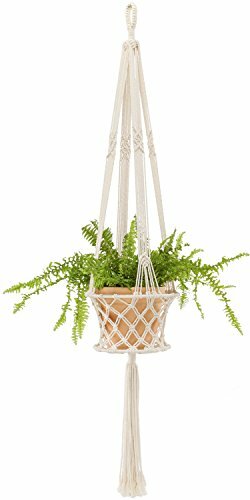 This macrame plant hanger is made of high quality cotton cord and metal ring, strong and durable. It is hand knotted to ensure its superior durability and hold securely even your largest plants! Not easy to deformation, corrosion resistance. Fits for indoor and outdoor use and also can match with flowerpot to decorate hotel or parties. Give you a fashionable household life and a different rural life. With this macrame wall hanging planter you'll instantly add a bohemian vibe to your room and it will really warm up a space.